Dr. Bobby L. Sparks has been a long-time student of the Old Testament, especially Dr. Bobby L. Sparks is a graduate of the Texas Baptist Institute and Seminary in Henderson, Texas. He has intensely researched and studied the Old Testament tabernacle and related subjects for over 25 years. His lectures on these subjects have become very popular in seminaries and churches throughout the United States and several foreign countries.These lectures and his work on the scale models of the tabernacle have earned for Dr. Sparks recognition as an authority on the Old Testament tabernacle. Dr Sparks makes products available to ICP for benefit of ICP ministry! A thirteen lesson video series that covers every aspect of the tabernacle and furniture. The lessons contain virtual reality along with other graphics. Your heart will be made to rejoice as the glory and majesty of Jesus Christ is revealed in these lessons. Plus, there is an additional feature on the spiritual significance of the priesthood and their magnificent dress. This video series is excellent for everything from large churches, small groups or personal study. The technology in the production of this video on the tabernacle has no equal. 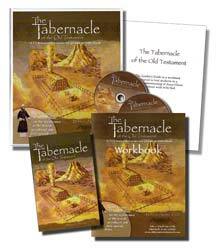 The DVD package contains 2 DVD's, 1 copy of The Tabernacle of the Old Testament book, 1 student workbook and 1 leader's guide to direct the study. You may order directly from the author, but if you want part of the price to go to the ministry of translating and publishing Bible study materials through ICP please order by making a $100.00 minimum contribution to ICP. Contacts us by telephone, at 903 278 2648 or email to billjohnson@icplit.org or mail check to ICP, P. O. Box 2587, Texarkana, TX 75504. You may go to the web site of The Tabernacle of the Old Testament for complete information about the ministry of Dr. Bobby Sparks. Of you may contact Dr. Sparks at: bsparks@oldtestamenttabernacle.com. Will you help provide literature for them? Heritage, Texarkana, Texas gives five thousand dollars to Romanian Press Fund...Full story. Faith Promise Missions Conference, Odessa,TX...full story. The Johnsons visit Missionary Danny Jones in Udon Thani...full story. Record forty-three attend worship in Chiang Mai...full story. The Johnsons had a busy month in October. The Lord's churches gave liberally...full story..